The Porter family, owners of Queenstown Park Station, are delighted to once again open this unique high country station for recreational mountain bike riding on Sunday 17 February 2019. This is an opportunity to experience spectacular landscape and views of the Shotover and Kawarau Rivers from a new perspective. This is a community open day for riding and you’re encouraged to take your time, stop often to enjoy the views. We’ll also be joined by a small selection of food sellers. Feel free to bring a picnic or buy food at our midway picnic beach. Riders can check in from 9am and collect an electronic transponder for accountability purposes on the ride which will be placed on your left ankle. 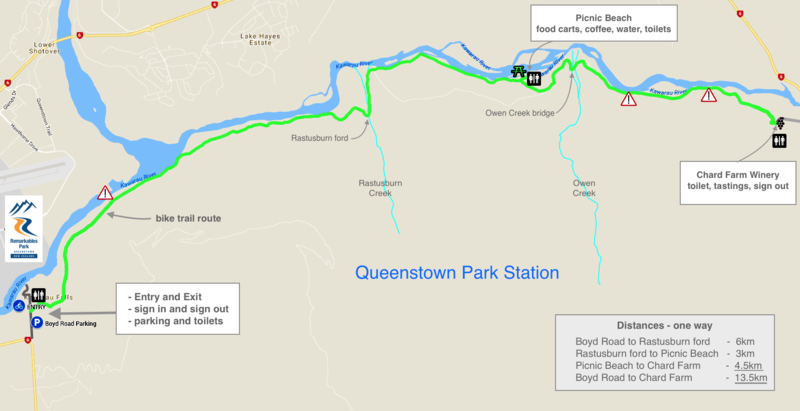 Riders can start any time between 9:30am and 11:00am at Boyd Rd off SH6 south of the Kawarau Bridge and finish by 4:00pm, exiting either back to Boyd Rd or Chard Farm to ride on out to the Queenstown Trails. Who is the ride aimed at/how fit do I need to be? You’ll need moderate fitness to ride the undulating trails, a mountain bike in good working order, plenty of water and food – and of course your camera/phone! Children under 10 are most welcome, but they must ride with an adult and must be capable of riding up to 18km on undulating farm track which does have some hills and can be sandy in a few parts and includes a stream crossing. We’ll be joined at the midway picnic beach area (9.2km into the ‘Station Loop' ride) by a number of food sellers. There will also be a water top-up station here. Toilets will be provided at the ride start (Boyd Road), at the midway picnic beach and there will also be toilets on completion of the ‘Station to Chard Farm’ ride at Chard Farm. Parking is available on Boyd Road (and in a nearby paddock) as indicated on the map. A pickup point is available for those doing the ‘Station to Chard Farm’ ride at Chard Farm. Marshals will be manning the gate there and participants are asked to follow the directions of the Organisers at all times and to please consider the Station neighbours by parking appropriately and as directed. There is not an option to park and start the ride from Chard Farm. Unfortunately, a postponement date is not possible. Please check the event Facebook page before 8:30am on 17 February should adverse weather be forecast for confirmation of the ride being cancelled, or call Adrian 021 991 899. *Special thanks to neighbouring landowners Mike & Bridget Mee at Boyd Road, Rob & Gerdi Hay at Chard Farm, all Remarkables Park, and Queenstown Station staff and our volunteers who make this such an enjoyable day for all participants. To register or for more information visit the event website.